Toxoplasmosis is the leading cause of focal central nervous system (CNS) disease in AIDS. CNS toxoplasmosis in HIV-infected patients is usually a complication of the late phase of the disease. Typically, lesions are found in the brain and their effects dominate the clinical presentation. Rarely, intraspinal lesions need to be considered in the differential diagnosis of myelopathy. The decision to treat a patient for CNS toxoplasmosis is usually empiric. Primary therapy is followed by long-term suppressive therapy, which is continued until antiretroviral therapy can raise CD4+ counts above 200 cells/µL. Prognosis is guarded. Patients may relapse because of noncompliance or increasing dose requirements. CNS toxoplasmosis results from infection by the intracellular parasite Toxoplasma gondii. It is almost always due to reactivation of old CNS lesions or to hematogenous spread of a previously acquired infection. Occasionally, it results from primary infection. Clinical CNS toxoplasmosis occurs in 3-15% of patients with AIDS in the United States. Some clinically silent lesions come to diagnosis only at autopsy. Clinical CNS toxoplasmosis occurs in as many as 50-75% of patients in some European countries and in Africa. CNS toxoplasmosis begins with encephalitis and constitutional symptoms and headache. Fever is usually but not always present. Later, confusion and drowsiness, seizures, focal weakness, and language disturbance develop. Without treatment, patients progress to coma in days to weeks. Extracerebral involvement can also be seen including but not limited to pneumonitis, chorioretinitis, etc. On physical examination, personality and mental status changes may be observed. Seizures, hemiparesis, hemianopia, aphasia, ataxia, and cranial nerve palsies may be evident. Occasionally, symptoms and signs of a radiculomyelopathy predominate. 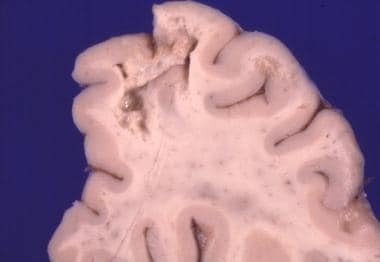 Like CNS toxoplasmosis, progressive multifocal leukoencephalopathy (PML) can cause mental status changes and focal signs. However, headache and seizures are unusual with PML, and PML lesions themselves cause no mass effect. Serologic studies in patients with CNS toxoplasmosis may demonstrate rising titers of anti-toxoplasma immunoglobulin G (IgG) antibodies. An immunoglobulin M (IgM) antibody response is seen in cases of newly acquired toxoplasmosis or Toxoplasma encephalitis. However, anti-Toxoplasmagondii IgG detection may be unreliable in immunodeficient individuals who fail to produce significant titers of specific antibodies. In one study, 16% of patients with a clinical diagnosis and 22% of patients with a histologic diagnosis of toxoplasmosis had undetectable anti-T gondii IgG levels. Causes of false-negative results also include recent infection and insensitive assays. CSF findings may also include elevated protein and variable glucose and WBC counts. The presence of Epstein-Barr virus DNA in the CSF favors the diagnosis of lymphoma. A brain CT scan or MRI with and without contrast is indicated for all patients presenting with altered mental status, headaches, seizures, or focal neurologic signs. MRI clearly is the superior technique but is not available universally. Single or multiple hypodense or hypointense lesions in white matter and basal ganglia with mass effects may be observed on CT or MRI scans. Lesions may enhance in a homogeneous or ring pattern with contrast (see the images below). Imaging studies may be normal in diffuse toxoplasmosis. 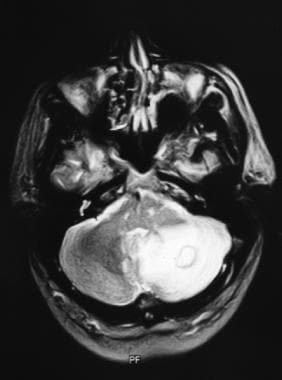 T1-weighted MRI after gadolinium contrast shows a hyperintense lesion in the left cerebellar hemisphere. T2-weighted MRI demonstrates intense edema surrounding the lesion. Single lesions favor the diagnosis of lymphoma over that of toxoplasmosis. However, while multiple lesions are more common than single lesions in toxoplasmosis, in one study 27% of patients had a single lesion on CT scan. In the same study, 14% had a single lesion on MRI. MRI is more sensitive than CT scan in detecting multiple lesions. 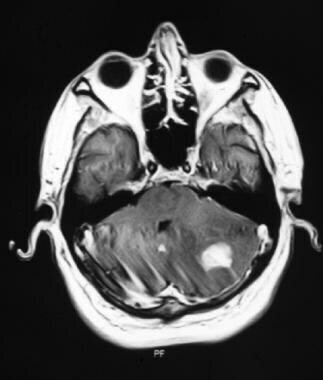 If the initial imaging study is normal or shows atrophy or focal signal abnormalities (but no mass lesion), diagnostic consideration should be given to meningitides, AIDS dementia complex, or progressive multifocal leukoencephalopathy. If imaging shows one or more focal mass lesions with impending herniation, an open biopsy with decompression is indicated. Treatment for lymphoma, toxoplasmosis, or other opportunistic infections and neoplasms is initiated, depending on biopsy results. If imaging shows one or more focal mass lesions without impending herniation, additional studies are warranted. Diagnostic yield of stereotactic biopsies increases with the number of specimens obtained. Toxoplasma gondii abscesses are seen on this brain slice. Contributed by Dr Beth Levy, Saint Louis University School of Medicine, St Louis, Missouri. High-magnification photomicrograph shows a tissue cyst and tachyzoites in the brain parenchyma. Contributed by Dr Beth Levy, Saint Louis University School of Medicine, St Louis, Missouri. In patients in whom brain imaging shows multiple lesions, whether serologic results are negative or positive, antitoxoplasmosis therapy should be initiated. In cases of impending herniation, an open biopsy with decompression is indicated. Corticosteroid treatment may be warranted in cases of impending brain herniation. However, their use may complicate the interpretation of a response to antitoxoplasmosis therapy. Empiric antimicrobial therapy must be comprehensive and should cover all likely pathogens in the context of the clinical setting. Antibiotic combinations usually are recommended to circumvent resistance from bacterial subpopulations (which may be resistant to one of the antibiotic components) and to provide additive or synergistic effect. Sulfadiazine: 1000 mg 4 times daily among patients < 60 kg or 1500 mg four times a day among patients >60 kg. Pyrimethamine: 200 mg loading dose followed by 50 mg daily among patients< 60 kg or 75 mg daily among patients >60 kg. Leucovorin should be administered to prevent pyrimethamine induced hematologic toxicity. Dose can be 10-25 mg daily. With antibiotic therapy, 74% of patients improve by day 7, and 91% improve by day 14. Imaging studies are performed every 4-6 weeks until complete resolution of the lesion or stabilization after partial resolution. Primary therapy is given for 6 weeks, followed by long-term suppressive therapy at reduced doses, with the duration determined by response to highly active antiretroviral therapy (HAART). The long-term suppressive therapy can be discontinued in patients with persistent elevation of CD4+ counts greater than 200 cells/µL and resolution of lesions on MRI. The preferred prophylactic regimen is one double-strength tablet of trimethoprim-sulfamethoxazole (TMP-SMZ) daily, which also provides prophylaxis against Pneumocystis jiroveci pneumonia (PCP). An alternative regimen is one double-strength TMP-SMZ tablet 3 times weekly. The recommended alternative for patients who cannot tolerate TMP-SMZ is dapsone-pyrimethamine plus leucovorin, which is also effective against PCP. What is CNS toxoplasmosis in HIV infection? What is the pathophysiology of CNS toxoplasmosis in HIV infection? What is the prevalence of CNS toxoplasmosis in HIV infection? 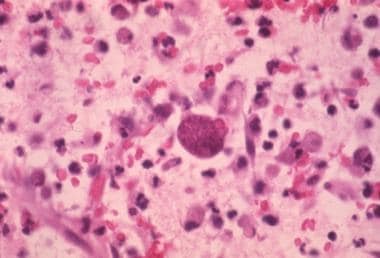 Which clinical history findings are characteristic of CNS toxoplasmosis in HIV-infected patients? Which physical findings are characteristic of CNS toxoplasmosis in HIV-infected patients? Which conditions are included in the differential diagnoses of CNS toxoplasmosis in HIV infection? What is the role of serologic studies in the workup of CNS toxoplasmosis in HIV infection? How is CNS toxoplasmosis in HIV infection diagnosed? What is the role of imaging studies in the workup of CNS toxoplasmosis in HIV infection? What is the role of MRS in the workup of CNS toxoplasmosis in HIV infection? What is the role of brain biopsy in the workup of CNS toxoplasmosis in HIV infection? Which histologic findings are characteristic of CNS toxoplasmosis in HIV infection? How is CNS toxoplasmosis treated in patients with HIV infection? How is CNS toxoplasmosis prevented in patients with HIV infection? [Guideline] Kaplan JE, Benson C, Holmes KH, Brooks JT, Pau A, Masur H. Guidelines for prevention and treatment of opportunistic infections in HIV-infected adults and adolescents: recommendations from CDC, the National Institutes of Health, and the HIV Medicine Association of the Infectious Diseases Society of America. MMWR Recomm Rep. 2009 Apr 10. 58:1-207; quiz CE1-4. [Medline]. Grant IH, Gold JW, Rosenblum M, Niedzwiecki D, Armstrong D. Toxoplasma gondii serology in HIV-infected patients: the development of central nervous system toxoplasmosis in AIDS. AIDS. 1990 Jun. 4 (6):519-21. [Medline]. Ramírez-Crescencio MA, Velásquez-Pérez L, Ramírez-Crescencio MA, Velásquez-Pérez L. Epidemiology and trend of neurological diseases associated to HIV/AIDS. Experience of Mexican patients 1995-2009. Clin Neurol Neurosurg. 2013 Jan 28. [Medline]. Jones JL, Roberts JM. Toxoplasmosis hospitalizations in the United States, 2008, and trends, 1993-2008. Clin Infect Dis. 2012 Apr;54(7):e58-61. Epub 2012 Jan 19. [Medline]. Mesquita RT, Ziegler AP, Hiramoto RM, Vidal JE, Pereira-Chioccola VL. Real-time quantitative PCR in cerebral toxoplasmosis diagnosis of Brazilian human immunodeficiency virus-infected patients. J Med Microbiol. 2010 Jun. 59:641-7. [Medline]. Alfonso Y, Fraga J, Fonseca C, et al. Molecular diagnosis of Toxoplasma gondii infection in cerebrospinal fluid from AIDS patients. Cerebrospinal Fluid Res. 2009 Mar 6. 6:2. [Medline]. [Full Text]. Mahadevan A, Ramalingaiah AH, Parthasarathy S, Nath A, Ranga U, Krishna SS. Neuropathological correlate of the "concentric target sign" in MRI of HIV-associated cerebral toxoplasmosis. J Magn Reson Imaging. 2013 Feb 25. [Medline]. Westwood TD, Hogan C, Julyan PJ, et al. Utility of FDG-PETCT and magnetic resonance spectroscopy in differentiating between cerebral lymphoma and non-malignant CNS lesions in HIV-infected patients. Eur J Radiol. 2013 Apr 8. [Medline]. Sonneville R, Schmidt M, Messika J, et al. Neurologic outcomes and adjunctive steroids in HIV patients with severe cerebral toxoplasmosis. Neurology. 2012 Oct 23. 79(17):1762-6. [Medline]. Dedicoat M, Livesley N. Management of toxoplasmic encephalitis in HIV-infected adults (with an emphasis on resource-poor settings). Cochrane Database Syst Rev. 2006. 3:CD005420. [Medline]. Fung HB, Kirschenbaum HL. Treatment regimens for patients with toxoplasmic encephalitis. Clin Ther. 1996 Nov-Dec. 18(6):1037-56; discussion 1036. [Medline]. Bertschy S, Opravil M, Cavassini M, et al. Discontinuation of maintenance therapy against toxoplasma encephalitis in AIDS patients with sustained response to anti-retroviral therapy. Clin Microbiol Infect. 2006 Jul. 12(7):666-71. [Medline]. Behbahani R, Moshfeghi M, Baxter JD. Therapeutic approaches for AIDS-related toxoplasmosis. Ann Pharmacother. 1995 Jul-Aug. 29(7-8):760-8. [Medline]. AAN Quality Standards Subcommittee. Evaluation and management of intracranial mass lesions in AIDS. Report of the Quality Standards Subcommittee of the American Academy of Neurology. Neurology. 1998 Jan. 50(1):21-6. [Medline]. Klepser ME, Klepser TB. Drug treatment of HIV-related opportunistic infections. Drugs. 1997 Jan. 53(1):40-73. [Medline]. Marra MC. Infections of the central nervous sytem in patients infected with human immunodeficiency virus. Continuum. 2006. 12:111-32. Offiah CE, Turnbull IW. The imaging appearances of intracranial CNS infections in adult HIV and AIDS patients. Clin Radiol. 2006 May. 61(5):393-401. [Medline]. Verma A. Neurological manifestations of human immunodeficiency virus infection in adults. Neurology in Clinical Practice. 2004. Vol 2: 1581-1601. Walker M, Zunt JR. Parasitic central nervous system infections in immunocompromised hosts. Clin Infect Dis. 2005 Apr 1. 40(7):1005-15. [Medline]. [Full Text].